Site: Choose an area that is well drained with rich soil. 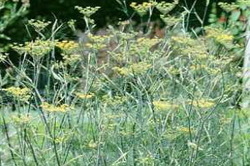 Dill plants like full sun with afternoon shade. 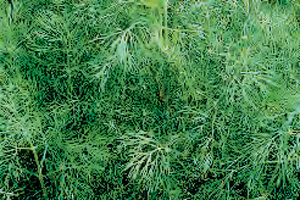 Growing: Dill grows best in spring and fall and does not do well when the hot part of summer sets in. About 85 degrees is the hottest it can stand before it shrivels up and dies or bolts to flower. It grows to about a foot or so tall and the flower stalks extend up to 3 feet tall. Harvesting: To harvest seeds, cut the stems when the flower-heads have turned brown. Tie a paper bag over each flower-head and hang the stems upside-down in bunches. The leaves are tender and delicate so they must be used as soon as they are cut. You can begin cutting as soon as the plant is about 6" tall by removing the outer leaves and leaving the main stem intact for the new leaves to grow from. Culinary Uses: Chop the leaves before adding to dips, cream sauces for fish like salmon, salad dressings, tuna and chicken salads, stuffed eggs, coleslaw, and pickles of course. Dill is exceptionally good with sour cream, yogurt, and cream cheese. The main use of the seeds is in pickling vinegar for cucumbers, but they can also be added to cakes, bread, fish and rice dishes.